Feed your body with what counts! HHGFIT is designed around creating a healthier you! Our mission is to bring innovative nutritional and nutraceutical products unlike anything in the industry! Our HHGFIT line is comprised of impact products that make a difference in your life and the lives of the people around you. HHG’s FIT line of products are proven and backed with science and extensive research geared towards helping with some of the world’s biggest health issues. Our goal is to make a difference in the way you feel and to keep your body operating at optimal performance. HHG strongly believes in fighting against some of the biggest health issues that people face in today’s world. These issues affect millions of families around the world. The clustering of these traits has been linked to an increased risk for heart disease, diabetes, heart attack, and stroke. And the more of them you have, the greater your risk. It's very important to "know your numbers'': your cholesterol levels, blood pressure, blood sugar, and triglyceride levels (blood fats). That's because even someone who is only mildly overweight -- but who carries the extra fat around their middle and has mild high blood pressure and elevated blood sugar -- is at risk. Most people with metabolic syndrome also have insulin resistance. That means the body does not properly use insulin, the hormone that regulates blood sugar levels. An estimated 86% of people with diabetes also have metabolic syndrome. A diet high in unhealthy fats, sugars, and calories along with a lack of regular physical activity can certainly contribute to the risk factors for metabolic syndrome. The actual causes of metabolic syndrome may be many, but researchers lean toward insulin resistance as the underlying problem. Overweight people tend to develop a resistance to insulin -- a hormone that regulates blood sugar levels, pushing sugar into the body's cells, where it is used for energy. When you're resistant to insulin, blood sugar isn't effectively delivered into the cells. That leads to high blood-sugar levels in the bloodstream, which is one of the symptoms (and causes) of type 2 diabetes. A recent study in the Archives of Internal Medicine suggests that metabolic syndrome is on the rise, especially among adults in their mid-30s. Researchers found that the young adults with metabolic syndrome had gained fat around their midsections and were much less physically active in their 30s, compared to their teen years. The researchers also noted that more men were diagnosed with the condition than women in this age group. According to the National Cholesterol Education Program, some 24% of young adults over 20 have metabolic syndrome. That number swells to 44% by age 50. To lower your odds of developing the risk factors of metabolic syndrome, make sure your eating plan is full of fruits, vegetables, whole grains, and low-fat dairy. It makes perfect sense that the new dietary guidelines for Americans recommended three servings of whole grains each day. Studies have shown that whole grains can lower the risk of heart disease and certain cancers -- and now you can add metabolic syndrome to that list. Eating whole grains can improve insulin sensitivity and reduce the risk of metabolic syndrome, according to a study published Diabetes Care. Whole-grain carbohydrates, fruits, and vegetables tend to be absorbed slowly by the body and help normalize blood sugar. And wine lovers can rejoice; a glass or two per day is good for your health. The new dietary guidelines condone it -- and so does a study suggesting that a glass or two of wine may actually lower a person's risk for developing metabolic syndrome. Moderation is key, though. The health benefits become risks if you overindulge and drink more than one or two glasses of wine a day. 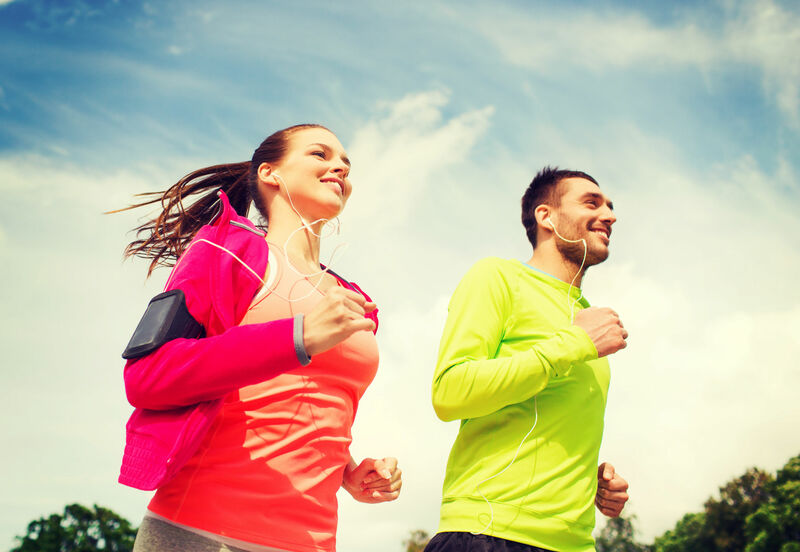 Many studies have documented the effectiveness of physical activity along with a healthy diet. One study in the Archives of Internal Medicine found that exercise and weight loss helped to reduce blood pressure and improve insulin sensitivity in people with metabolic syndrome. Exercise helps burn fat (especially around the waist), increases "good" cholesterol, and lowers blood pressure, according to a study published in the American Journal of Preventive Medicine. So add preventing metabolic syndrome to the long list of benefits that can result from a healthy diet and regular physical activity. Originally published February 18, 2005. SOURCES: Archives of Internal Medicine, Jan. 10, 2005. Archives of Internal Medicine, 2003; 163. Journal of the American College of Cardiology, Nov. 16, 2004. American Journal of Preventive Medicine, Dec. 30, 2004. Diabetes Care, February 2004. European Society of Cardiology Congress 2003, Vienna, Aug. 30-Sept. 3, 2003. News release, European Society of Cardiology. National Cholesterol Education Panel. Oct. 22, 2007 -- The obesity epidemic is actually a worldwide pandemic that has global implications for health and disease, new research shows. In one of the largest studies ever to examine obesity rates across the globe, researchers found that more than 60% of men and 50% of women were either overweight or obese. They concluded that obesity is a growing problem in all regions of the world, even among traditionally lean Asian populations. "The study shows that excess body weight is pandemic, with one-half to two-thirds of the overall study population being overweight or obese," researcher Beverley Balkau, PhD, of the French health service INSERM, says in a news release. The study involved 69,409 men and 98,750 women from 63 countries across five continents evaluated by their primary care doctors for body weight, height, cardiovascular disease (heart disease or stroke), diabetes, and waist circumference. The U.S. was not included in the study. Waist circumference is now considered an important marker of obesity-related diseases such as heart disease and diabetes. A waist circumference of more than 40 inches in men and 35 inches in women is considered a risk factor for these diseases. The people in the study had visited their doctor on one of two specially designated days in which detailed information on weight, height, waist circumference, and disease history were collected for the trial, providing a snapshot of the prevalence of obesity worldwide. Body mass index (BMI) was calculated from the weight and height measurements. BMI looks at a person's weight in relation to height and is used to determine obesity and overweight. Forty percent of men and 30% of women met the criteria for being overweight, meaning they had a BMI of 25 to 29.9. Fully a quarter of men and women met the BMI definition of obese (BMI of 30 or greater), but obesity rates did differ by region, ranging from a low of 7% among men and women living in southern and eastern Asian countries to a high of 36% among men and women living in Canada. Just under one in three men and almost half of the women had waist circumferences of more than 40 and 35, respectively, putting them at higher risk for heart disease and diabetes. The rate of diagnosed heart disease among male and female study participants was 16% and 13%, respectively. A total of 13% of men and 11% of women had known diabetes. The men and women in the study with the largest waists were more than twice as likely as those with the smallest waists to have heart disease. Diabetes risk was three times higher for the quarter of men with the biggest waists and almost six times higher for women, compared with the quarter of the study population with the smallest waists. The study is published in the latest issue of the American Heart Association (AHA) journal Circulation. While people living in southern and eastern Asia fared better than other populations in terms of obesity and waist circumference, the researchers point out that this is not necessarily reassuring because their rates of obesity are also rising. American Heart Association spokesman Gerald Fletcher, MD, of the Jacksonville branch of the Mayo Clinic, tells WebMD that the study provides important confirmation of the global reach of obesity. "We have known that obesity is a worldwide problem, but this is the largest study yet to actually show this," he says. Balkau and colleagues conclude that unless the trend is reversed, the rise in obesity will result in major increases in sickness and death from related diseases like diabetes. Fletcher agrees, adding that major public health initiatives are needed to address the problem. "We have seen that such initiatives can work to reduce cigarette smoking," he says. “We have to have the same kind of commitment to make a difference in obesity rates." Mention heart disease, and most people picture a heart attack. But the term covers several conditions that can hurt your ticker and keep it from doing its job. These include coronary artery disease, arrhythmia, cardiomyopathy, and heart failure. Learn the warning signs of each and how to react. A buildup of sticky plaque (fat and cholesterol) can narrow your heart's arteries, making it harder for blood to pass through. Many people don't even know there's a problem until an artery is clogged and they have a heart attack. 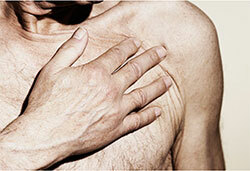 But there are warning signs of coronary artery disease, like frequent chest pain called angina. Plaque is hard on the outside and mushy on the inside. Sometimes that hard outer shell cracks. When this happens, a blood clot forms. If it completely blocks your artery, it cuts off the blood supply to part of your heart. 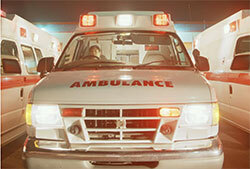 Blood carries oxygen, and a shortage of that can quickly damage the organ and possibly kill you. The attack is sudden, and it's important to get medical help right away. It's an emergency even when your symptoms are mild. Women don't always feel chest pain. Compared to men, they're more likely to have heartburn or heart flutters, lose their appetite, cough, or feel tired or weak. Don't ignore these symptoms. The longer you wait to get treatment, the more damage can be done. If you think you're having a heart attack, call 911 right away, even if you're not sure. Don't wait to see if you feel better. And don't drive yourself to the hospital. The EMS team will come to you and start work right away. A fast response can save your life. Your heart beats because of electrical impulses, and they can get off rhythm. 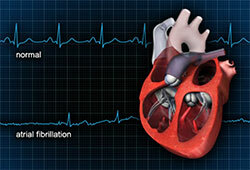 Arrhythmias can make your heart race, slow down, or quiver. They're often harmless and pass quickly, but some types can affect your blood flow and take a serious toll on your body. Tell your doctor if you notice anything unusual. 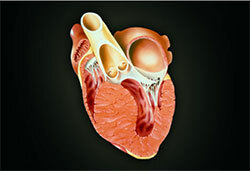 Abnormal heart muscle, or cardiomyopathy, makes it hard to pump and carry blood to the rest of your body. Over time, health problems such as high blood pressure, obesity, and diabetes cause this serious condition, which can lead to heart failure. This doesn't mean your heart stops working. It means the organ can't pump enough blood to meet your body's needs. So over time, it gets bigger and pumps faster. This weakens the muscle and lowers the amount of blood flowing out even more, which adds to the problem. 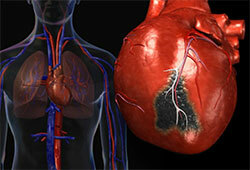 Most cases of heart failure are the result of coronary artery disease and heart attacks. This isn't the same as a heart attack. Sudden cardiac death happens when the heart's electrical system goes haywire, making it beat irregularly and dangerously fast. Instead of pumping out blood to your body, your chambers quiver. CPR can help bring back your regular heart beat, but without it, you can die within minutes. So don't wait to see if your symptoms go away. Call 911 as soon as possible. 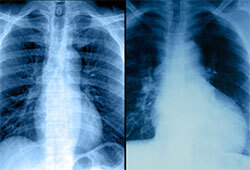 These pictures of your heart, lungs, and chest bones are made with a small amount of radiation. Doctors use them to spot signs of trouble. 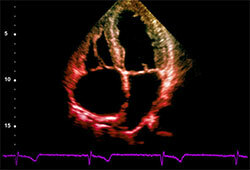 In this image, the bulge on the right is an enlarged left ventricle, the main pumping chamber. Most types are long lasting. At first, symptoms can be hard to spot and may not disturb your daily life. But left alone and ignored, they get worse. If your heart starts to fail, you might be short of breath or feel tired. 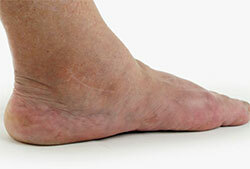 Keep an eye out for swelling in your belly, ankles, feet, or legs. In many cases, long-term treatment can help keep things under control. You can fight heart failure with medication, lifestyle changes, surgery, or a transplant. 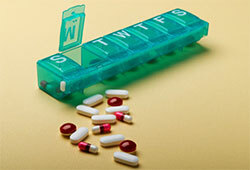 A number of prescription drugs can help you. Some lower blood pressure, heart rate and cholesterol levels. Others control irregular rhythms or prevent clots. If you already have some damage, others medications can help your heart pump blood. 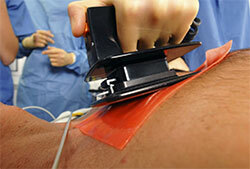 This procedure opens a blocked artery and improves blood flow. Your doctor guides a thin catheter with a balloon on the end into your artery. When the balloon reaches the blockage, the doctor fills it with air. This inflates your artery and allows blood to move freely. He may also put in a small mesh tube called a stent to keep it open. Your doctor might suggest this operation if you have one or more arteries that are too narrow or blocked. He first removes a blood vessel from an area of your body, such as your chest, belly, legs, or arms, and then attaches it to a healthy artery in your heart. Your blood is guided around the problem area, "bypassing" it. Men are more likely to have a heart attack than women, and at an earlier age. But heart disease is still the No. 1 killer of both sexes. People with a family history of it also have a higher risk. - Exercise regularly (30 minutes most days). - Stay at a healthy weight. - Eat a balanced diet. - Limit how much alcohol you drink (one drink a day for women, two a day for men). 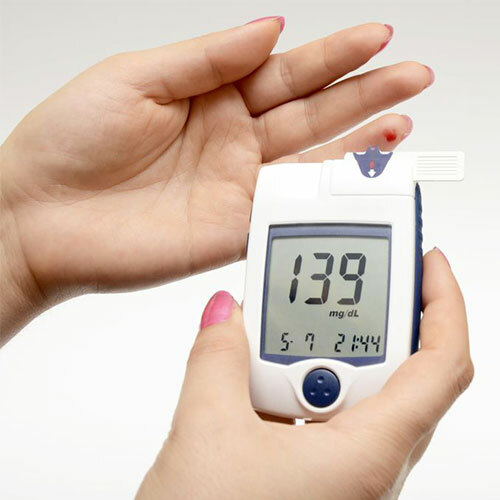 If you have diabetes, it's important to manage your blood sugar levels. And if you have high cholesterol and high blood pressure, do everything you can to get them in check. This information does not provide medical advice. Depression is classified as a mood disorder, and may be described as feelings of sadness, loss, or anger that interfere with a person’s everyday activities. According to the Centers for Disease Control and Prevention (CDC), depression affects one in 10 Americans. People experience depression in different ways. It can often interfere with your daily work and relationships. Depression can result in lost time at work and lower productivity. It also can influence some chronic health conditions. As if depression weren’t bad enough, statistics show that diagnoses are growing at an alarming rate. In addition, states with higher rates of depression also show high rates of other negative health outcomes, such as obesity, heart disease, and stroke. Individuals suffering from depression are more likely to be unemployed or recently divorced than their non-depressed counterparts, and women experience greater risk of depression than men. Despite all of these statistics on depression, this infographic shows that many people suffer symptoms of depression without seeking care, and that undiagnosed depression costs the U.S. millions of dollars each year. Now a global health issue, depression awareness, diagnosis, and treatment are matters of crucialsignificance in building a healthier, happier world. Take the PURE Challenge! 100's of people who have accepted the challenge have lost an average of 8-15lbs. in 15 days! 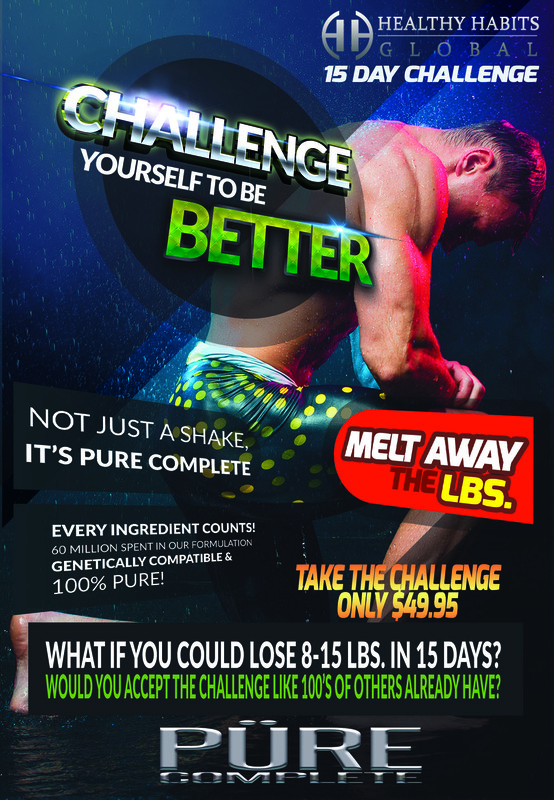 It's simple...Accept the challenge using PURE Complete, follow the meal plan included and melt the pounds away! Share health and create wealth! Start your own business today with HHG! By selecting a Fit kit you will receive HHG’s Fit products. This does not tie you to only this division of HHG. 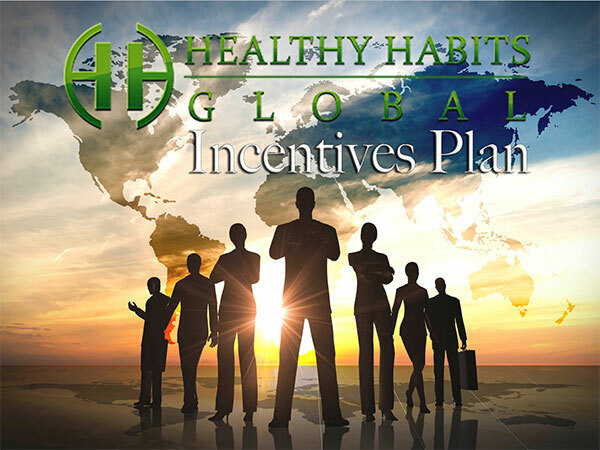 You will have the ability to market all products within all the divisions of HHG. PURE Complete is a plant based natural nutritional formula that enhances the body’s ability to lose weight and be healthy. Your nutrition must match your inherited DNA in order for it to be effective. 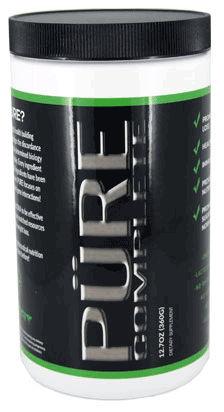 PURE Complete provides the necessary mass resources for health and healthy weight loss. Our ancestors adapted to the natural food sources that were available to them at the time. What was the available food source in the beginning of mankind? • Mostly vegetables and some fruits and very little meat for a healthy life. Humans adapted to a plant based diet with little meat providing source of sustained energy, dietary fiber and the source necessary for life. Whatever we ingest whether solid or liquid, if it is recognized by our digestive enzymes and intestinal flora, the shape of the solid or liquid molecule is cleaved into usable nutrition and gets utilized systemically. If it does not get recognized by the digestive enzymes and intestinal flora in our gut, the body is desperate to survive so it cleaves out simple carbs, converts it to sugar to use as energy and the rest gets deposited as toxins in our liver and kidneys. If over worked, then it degrades the operating efficiency of our liver and kidneys and the organs can no longer cleanse out the toxins. The toxins go into our blood stream, causing changes in gene expression. Changes in gene expression results in cellular damage, results in chronic degenerative diseases and ailments. Despite the huge weight loss industry and medical attention towards degenerative diseases, most health professionals don’t know where fat goes when it is lost. Misconception of where fat mass goes in weight loss is that it is converted to heat or energy. Most fat mass is removed or converted by breathing it out into carbon dioxide which is relatively unknown by the medical community. 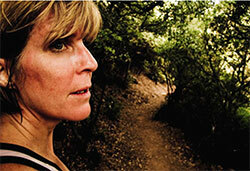 There is a massive misunderstanding or confusion of the metabolic process of losing weight. What are the primary reasons why the body holds on to fat and weight? #1 Published reason is inadequate nutrition at the cellular level. #3 Chronic dieting: stimulating the famine response and the body holds on to fat as a defense mechanism to conserve and survive. #4 Toxicity fat trigger: when the body is exposed to toxins, the body can’t eliminate toxins so the body’s natural reaction is not to burn the fat to create a buffer from the toxins and your body. (Toxins include pesticides, chemicals, processed foods, medications). 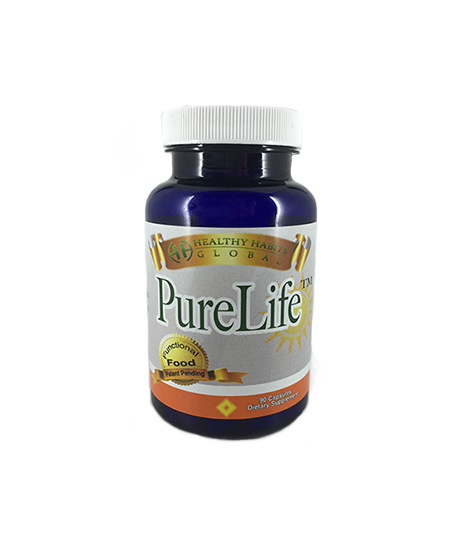 PURE Complete promotes the balance of intestinal bacteria in the gut that facilitates weight loss or natural distribution of how the body processes what we eat. People who struggle to lose weight have a greater number of firmicutes bacteria and fewer of bacteriodetes bacteria which creates a difference in our gut microbial ecology. The difference in our gut microbial ecology determines how many calories we can extract from what we eat and deposit into our fat cells. Joint project with U of Colorado, Cornell U, Wash School of Med have clinically proven that the balance of the bacteria population of B and F bacteria contribute to the cause of developing or overcoming: leptin resistance, triglycerides, fatty liver disease, obesity, diabetes, HBP, elevated cholesterol. PQQ used in PURE Complete ingredients promotes the regeneration of the mitochondria, the cells energy catalyst. “Exercise is helpful at burning calories and beneficial for the brain and is maximized at the proper time and quantity which people are unwilling to do.” Nielson’s global health and wealth survey. Obesity rates are accelerating BMI of 30+ • (671 Mil global obesity pop live in developed markets) 2013 global burden of disease study 2.1 B globally are overweight or obese (33% of world pop) 50% of consumers are actively trying to lose weight 88% of consumers are willing to pay more for food with healthier attributes. The unique formula of PURE Complete took 23 years and $60M. Efficacy of natural nutrition depends on how easy nutritional elements pass across all cell membranes and whether the nutritional elements can access targets within the cell and interact with all relevant enzymes of other cellular components. Within each cell there are a minimum of 4000 working enzymes and every cell type utilizes different types of enzymes. They had to understand the structural confirmation as well as partition coefficient of every molecule that will effect its bioactivity in relation to metabolic activity. This type of optimally balanced nutrition has never been done before. PURE Complete has the most powerful health building components in the world! It bridges the discordance between our ancient genetically determined biology and the nutritional needs of today. Every ingredient has a purpose and a nutritional value. All ingredients have been extensively studied and proven (100+ clinical studies that validates statements by HHG). PURE Complete focuses on nutrigenomics activity (nutrient gene activity), how our genes are expressed dictates how our cells are going to be, either harmed or healthy. 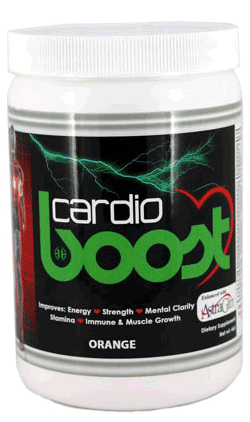 Cardio Boost is an ALL Natural Solution for Cardiovascular Health that addresses all your heart needs at once. is the result of years of research bringing the right combination of ingredients together in order to completely address the needs of the cardiovascular system. The 1998 Nobel Prize for medicine was given to Dr. Louis Ignarro and his partners for their research on the Nitric Oxide Pathway. Nitric Oxide is created naturally by your body when given the amino acid L-Arginine. This research created a frenzy of interest both in the pharmaceutical and nutraceutical fields! Now, there are over 100,000 published medical studies attesting to the fact that amino acid L-Arginine will help the human body regulate every aspect of cardiovascular function. This research has led to several, very effective pharmaceutical medications. The key to the formula is 5 grams of arginine. According to Dr. Ignarro's research, the human body needs this level of arginine, in combination with other ingredients found in Cardio Boost, to take Nitric Oxide levels to the point where it can Reverse the Age of the Cardiovascular System! Now approved by leading medical experts, this natural breakthrough is drawing attention all over America. Why? Because of its ability to help dissolve dangerous blood clots starting in just two hours and improve your circulation without drugs or doctors! 3. 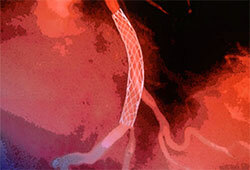 Creates blood clots that act like rebar framework (reinforcing metal rods). The result? Blood clots can clog or block tiny veins and arteries throughout your body, causing you problems ranging from cold hands and feet to varicose veins, from cramping in your legs to vision problems, from a weak heart to high blood pressure, from lagging libido to low energy. 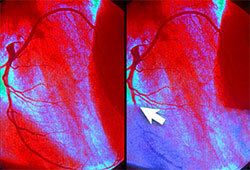 In the worse case, your larger arteries are not just clogged, they're completely BLOCKED! And when that happens, bingo, blood flow is cut off to your heart, brain or lungs—and you could have a health catastrophe! · A 1-in-4 chance of being struck down by a heart disaster? · A 1-in-6 chance of being felled by a brain catastrophe? 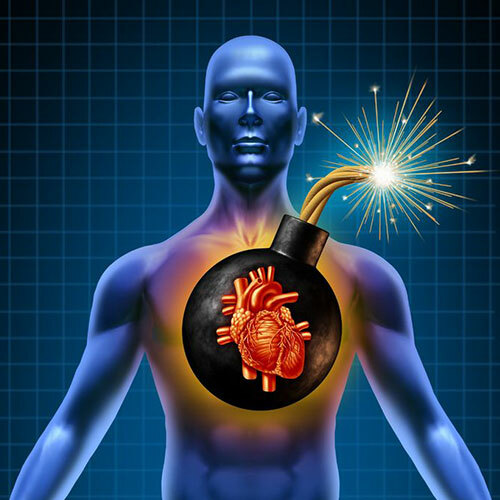 · 925,000 folks will die of heart-related calamities—that's nearly 2,500 a day! · More than 200,000 people will die due to blood clots in the legs! Get ready for your own health miracle! · Giving your whole circulation system a healthy boost. When I say whole circulation system, I mean it. In fact, did you know your body's circulation system is made up of roughly 75,000 miles of arteries, blood vessels and capillaries—filled with six liters of blood? Now picture thin, healthy, toxin-free blood coursing through all of your arteries, blood vessels and capillaries. Picture health-boosting nutrients, life-giving oxygen and immune-boosting cells flowing through your entire circulatory system—going directly to your organs, limbs and tissues. Arginine is also a powerful immune stimulant and wound-healing agent. At one time, this was thought to be exclusively due to its growth hormone releasing properties; but arginine is a powerful immune stimulant and wound healing agent even in the absence of significant growth hormone release. It is now known that arginine has other important benefits as a precursor of nitric oxide. Safety Notes: Arginine can enhance the growth of herpes viruses and pseudomonas bacteria. Anyone with herpes infections of the brain or eye or with any serious pseudomonas infection should never use arginine. Anyone with other latent or active herpes infections should use arginine only with extreme caution. Although arginine can promote the growth of these two infections, arginine also enhances the immune system, so the end result of arginine use can be positive or negative. 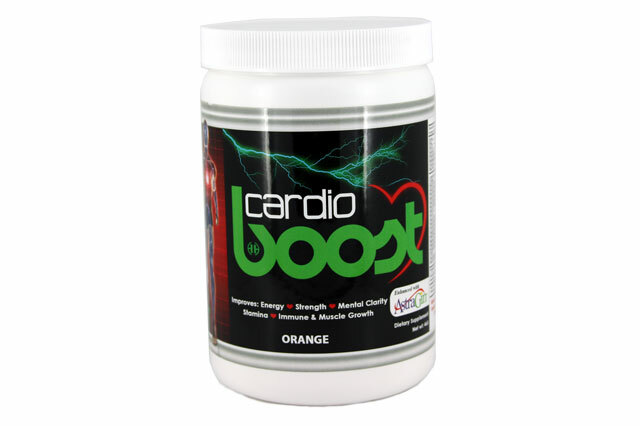 Cardio Boost is manufactured by a fully licensed nutraceutical and dietary supplement manufacturing company. The facility and equipment meet the current Good Manufacturing Practice (cGMP) Guidelines along with the strict FDA and state department regulations. Every aspect of the manufacturing, packaging, quality control, testing and product evaluation are done to ensure that we surpass not only USP standards… but also our customers expectations. An outside independent lab is used to guarantee every product manufactured maintains a high quality standard. In addition, bacteriological tests are performed on all raw materials to ensure our products are free from pathogens, yeast, mold and fungi. Our manufacturer has experienced personnel with backgrounds in clinical and industrial pharmacy, pharmaceutics, processing and dietary supplement manufacturing for over 20 years. Our staff participates in on-going education, research and new product development to keep us at the top of our field. A. L-arginine or arginine is among the 22 amino acids (nitrogen-containing molecules that form protein), which are the building blocks of the body. As well as being vital for growth and the repair of the body tissue, they are used to make hormones, enzymes, antibodies, and neurotransmitters, and help transport substances around the body. Arginine is classified as being a non-essential amino acid. This means your body should produce enough of its own arginine; however, it simply does not produce enough; thus we need to get more arginine from our diet. Arginine is found in meat, poultry, fish, eggs, dairy and nuts. Very little is found in fruits and vegetables, which may be detrimental to a vegetarian diet. Q. Why do I need to take an arginine supplement if I am getting it in my diet? A. You simply are not getting enough in your diet. The average American diet will contain about 3.3 to 5.4 grams of arginine while the vegetarian diet will contain almost one full gram less. Individuals over the age of 50, who are on a strict 'heart healthy' diet, take in about 2.6 grams of daily arginine. Arginine derived nitric oxide (ADNO) is decreased by poor diets, lack of exercise, age, high cholesterol, high blood pressure, diabetes and smoking. Because high concentrations of arginine can overcome the negative risk factors associated with heart disease and the average American is not getting enough in their diet, arginine supplementation simply makes sense. Q. Can I take too much arginine? A. Arginine has long been considered by nutritionists to be the least toxic of all the amino acids and its consumption, even in relatively huge quantities, seems to have very few adverse side effects. Clinical trials at hospitals in the U.S. and abroad have repeatedly administered 30 to 50 grams or arginine safely to patients without reported problems. Numerous body builders have long taken large doses of arginine with no reported ill effects. Q. What is the recommended daily dosage of an arginine supplement? A. The benefits of arginine supplementation are clearly dose-dependent and can range from between 5 to 30 grams taken orally every day. Q. I can buy arginine supplements at the local health food store in pill form and pay less. Why should I switch to a liquid formula when it costs more? A. This is a valid question; however, remember this fact of life...You get what you pay for! Anytime you take a pill, it is 10-20% absorbed; a capsule fairs a little better, it is 20-30% absorbed. This is according to the Physicians Desk Reference 2002. The reason a liquid or powder form of arginine is better, is because once it is mixed with a couple ounces of water, or taken straight, it is up to 98% absorbed. In fact, a liquid will bypass the digestive process and go directly into the blood steam into the cells within a matter of minutes. It does not have to worry about waiting until it arrives in your stomach where HCL (hydrochloric acid) must break it down and hope that it fully does before it enters your small intestine. I have seen x-rays that show pills fully intact in a person's colon and you can actually read the name stamped on the pill. According to the National Advisory Board, 100 mg consumed in a tablet form translates into a minute stabilized 8.3mg concentration in the blood. A recent exit poll at a health food store revealed that people in general do not like swallowing pills and would prefer taking a liquid. Imagine trying to swallow twelve 500 mg arginine pills (often referred to a horse pills) in an effort to get what you believe is 6 grams of arginine. When actually you are only getting about 600 mg to 1000 mg of arginine at best and if you do the math that relates to actually taking about 60 arginine pills each day. Now the cost of your arginine supplementation just went up by five times. I prefer to drink a shot glass of liquid arginine because it is easy to swallow, it is highly absorbable, it tastes great, it's actually very affordable at $40 per month and most importantly I am not flushing 90% of the arginine down the toilet. Q. Is it safe to take arginine with my medications? A. First off, anyone who is taking any medications prescribed by your doctor should continue taking those medications and certainly consult with your physician before changing your daily routine of medication. Going cold turkey with your prescription drugs could send your body into a tailspin. In the clinical trials performed over the last twenty years with the use of arginine, there have been no contraindications with any of the medications associated with cardiovascular disease like cholesterol, high blood pressure, diabetes and other heart medications. If you are monitoring your own sugar level, as in the case of diabetes, or blood pressure, keep a watchful eye as your levels begin to drop from taking arginine. When they remain at a lowered level, ask your doctor to adjust your medication dosage. My friend, if you are consistent with your daily dose of arginine, I am telling you there is great potential that one day your doctor will have you off all those toxic chemicals, which do nothing but cover-up the underlying problem—the lack of nitric oxide in your blood vessels. As far as the cholesterol lowering statin drugs like Lipitor, Zocor, Crestor, Mevacor or Pravachol, if you read my book (Let's STOP the #1 Killer in America TODAY), you would quickly discover I am not a big fan of these drugs. And it is my professional opinion that the moment you start to take arginine on a daily basis and commit to doing this for the rest of your now much extended life, you can throw away these toxic poisons forever. You must read my book to fully appreciate why I am so animate about this, but I will say that it is not the cholesterol number that is the issue. It is the oxidizing of the LDL cholesterol, which then becomes sticky and attaches to the vessel wall. Arginine prevents the oxidizing of the LDL cholesterol, thus no plaque build up and several studies actually attest to the plaque melting away. A. Oral arginine does not work as quickly as injections of arginine, but it does appear to work as well. Increasing your oral intake by only 50 to 100 percent of what you're already receiving from your food can begin to impact your health positively in a few short weeks. Many people have reported immediate changes in their energy levels. It is recommended that you keep a health journal so you can keep track of your changes as they happen. Some of the side effects one can expect are: increase in energy, improved memory, improved immune system, improved sleep, loss of weight, increase in muscle tone, decrease in pain, quicker wound healing, increase in sexual function and better athletic performance. Q. Can pregnant women take arginine? A. There are studies that show that arginine derived nitric oxide may benefit a unique form of hypertension called preeclampsia and may prevent premature labor and preterm birth. I have had many women take arginine throughout their entire pregnancy without any side effects or complications. Q. Is there anyone who should not take arginine supplements? A. Nutritionists have long considered arginine the least toxic of the amino acids, and its consumption, even in relatively huge quantities, seems to have very few adverse side effects. Numerous bodybuilders, for instance, have for years chronically consumed much greater quantities than my recommended dosage, and with no reported ill effects. Moreover, clinical trials at hospitals in the United States and abroad have repeatedly administered 30 to 50 grams of arginine safely to patients, again without reported problems. Q. Is it true that arginine can cause an outbreak of the herpes virus? A. Arginine cannot cause herpes outbreaks, but can exacerbate virus-replication during an outbreak if a low-grade arginine formula was consumed. The herpes virus (herpes virus hominis) typically lays dormant in humans until activated by stress, colds, lack of sleep, and nutritional factors. Low-grade arginine formulas can increase replication of the virus, so make sure you are using a pharmaceutical grade, quality form of arginine. Lysine is an amino acid that will prevent and help eliminate the herpes virus. I would recommend taking 500 mg of lysine everyday if you know you have herpes and start taking 1000 mg of lysine with 1000 mg of vitamin C at the first sign of an outbreak three times per day and make sure you separate taking arginine and lysine by at least two hours. Q. Can I give arginine to my children? A. A recent study showed that 60% of five to ten year old children already have at least on risk factor for cardiovascular disease; such as, high cholesterol levels, high blood pressure or diabetes. In today's fast food society, a single French fry we feed are children are more carcinogenic then giving them a cigarette. Both deplete the body of nitric oxide, which will lead to cardiovascular disease. There is a concern that arginine used by a child may cause their body to decrease the output of the growth hormone and thus stunt their growth process. Did you know your mom was right? You need to eat your fruits and vegetables! As America has moved away from fresh fruits and vegetables and consumed ever increasing amounts of processed foods, some containing synthetic steroid hormones, more and more chemical compounds and genetically modified organisms are all now found within the American food supply. The levels of cancer have skyrocketed, reaching alarming rates in all levels of our society. Cancer does not discriminate between male, female, young, old, rich, poor, illiterate or PhDs. No one or group has been spared. ~ Since 1990, 5 million people have died from cancer. 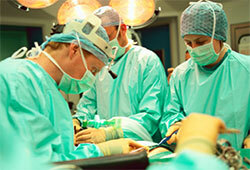 ~ Approximately 1.3 million new cases of cancer are expected to be diagnosed this year alone. ~ Men have a 1 in 2 lifetime risk of developing cancer. ~ Women have a 1 in 3 lifetime risk of developing cancer. ~ Cancer is the second leading cause of death; heart disease is the first. ~ One of every four deaths is from cancer. ~ Approximately 8 million Americans alive today have a history of cancer. Some can be considered cured, even if their cancer returns after 5 years. Others still have cancer. ~ The overall annual costs for cancer equal $107 billion; $37 billion of that amount accounts for direct medical costs. Treatment of breast, lung and prostate cancers account for more than half of the direct medical costs. The American Cancer Society states that up to 40% of all cancers can be prevented. Stimulate cell differentiation and stop cell division. The term differentiation refers to the process by which a cell in the body becomes mature and gains all of the features that it needs to work properly. Cancer cells divide, ignoring all signals to stop, and they do not differentiate properly. A compound in fruits and vegetables, such as carotenoid-derived vitamin A, that encourages a cell to differentiate will interfere with the process of uncontrolled abnormal division typical of cancer cells. Act as antioxidants. Free molecules of oxygen within cells, also known as free radicals, can cause damage to cells. Free radicals are produced by the cell as natural by-products of normal cell activities, or in response to harmful contact with something in its environment. Antioxidants, such as vitamin E, are compounds that absorb free radicals. Increase activity of detoxifying enzymes. Sometimes cells are exposed to cancer-causing compounds called carcinogens. The body uses enzymes to make these chemicals harmless (detoxify them). An enzyme is a protein produced by living cells that begins or speeds-up a chemical reaction in the body without being permanently changed itself. Some chemicals in fruits and vegetables, such as dithiolthiones in broccoli, have been shown to increase the activity of detoxifying enzymes in the body. Enhance immune function. The consumption of fruits and vegetables may strengthen the immune system, which is the body's defense against disease and cancer. As much as 30% of breast cancer risk has been linked to the way we eat. Dietary changes to eat more fruits and vegetables may provide women with an easy way to reduce their risk of developing breast cancer. People who eat 5 servings a day have HALF the risk of developing cancer as those who eat only 1-2 servings a day? A Harvard study of over 80,000 female nurses found that the long term risk-reducing benefits of a high folate intake rested mainly in women who supplemented their diets with a multivitamin containing folic acid. Folate can be found in dark leafy green vegetables. "IF YOU CAN'T AFFORD PREVENTION, HOW WILL YOU AFFORD DISEASE"? Diabetes. Unprocessed fruits and vegetables are high in dietary fiber and low in calories, just the combination needed to help reduce the risk for diabetes. One study showed that healthy eating along with daily physical activity reduced the risk of diabetes by 58% in a large group of overweight, diabetes-prone individuals. 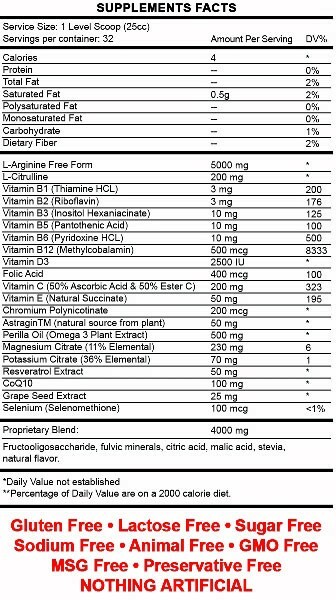 PureEssentials Fruits & Vegetables (A Whole Food Product) have all the nutrients and fiber without the sugar and salt. Eat a large variety of fresh fruits and vegetables including dark leafy greens and bright yellow and red fruits and vegetables. Eat at least 5 servings per day (5 to 9 are recommended). Fruits and vegetables are also high in many "phytochemicals" and antioxidants. One recent study2 looked at the levels of vitamin C in the blood and found that those people who ate the most fruits and vegetables (the primary source of vitamin C) had a 50% reduction in mortality from any cause. The researchers estimated that for every one-serving increase of fruits and vegetables, the risk for cancer dropped 15%, the risk for cardiovascular disease by 30% and the risk for death from any cause by 20%. These are remarkable decreases in mortality from just eating more fruits and vegetables! Many people are aware that nutrition experts recommend eating at least five servings of fruits and vegetables a day. A prolific body of evidence links produce intake to everything from lower blood pressure to a reduced risk of cancer and better vision. Fruits and vegetables also add fiber, vitamins, minerals and potentially valuable plant compounds like antioxidants to the diet. And as an extra bonus, fruits and vegetables also add flavor, variety, and texture to meals at a generally low calorie cost. In fact, non-starchy vegetables contain roughly only 25 calories per half-cup serving; a serving of fruit averages only about 60 calories. You know the importance of eating plenty of fruits and vegetables. During the summertime it's easy-- a salad is perfect when it's too hot to cook, or along with that grilled burger you eat an ear of corn, tomato slices, and watermelon for dessert. But by winter the only vegetables on your plate are potatoes. If this sounds familiar you may not be getting all the protective benefits that produce can provide against disease. A recent study in Public Health Nutrition points out that maintaining fruit and vegetable intake throughout the year is something that everyone needs do to reduce their risk of disease. A seven-year study included men and women, ages 35 to 75, who reported their usual intakes of fruits and salad vegetables, such as leafy greens, tomatoes, and cucumbers, during the summer and winter months. The researchers analyzed this information and found that fruit and vegetable consumption appeared to provide protection from heart disease in women, particularly in those who ate the most salad vegetables year-round. In men, consistent consumption of fruits and vegetables in both winter and summer also offered the most benefit; men who ate salad vegetables year-round were less likely than other men to suffer from heart disease and cancer. The findings of this study are consistent with many others: eating fruits and vegetables plays a significant role in disease risk reduction. And consistency appears to be the key, since people who make the effort to eat a produce-rich diet on a regular basis are healthier than people who wait for summer season fruits and vegetables to add variety to their diets. The problem with today's food supply is that farmland soil is depleted of minerals and most of the food we eat is highly processed. The more you heat and process food, the more enzymes, vitamins and minerals are lost. Thus, it's virtually impossible to get all the nutrition you need from today's food supply. It is very clear that we need to take nutritional supplements in today's modern world. "Use plant foods as the foundation of your meals. ... Eating a variety of grains (especially whole-grain foods), fruits, and vegetables is the basis of healthy eating." Pure Complete has the most powerful health building components in the world. It bridges the discordance between our ancient, genetically determined biology and the nutritional needs of today. Every ingredient has a purpose and a value and all ingredients have been extensively studied and proven! Pure focuses on NutriGenomic activity, nutrient-gene interaction!Nutrition must match inherited DNA to be effective and Pure Complete provides the necessary matched resources for health and healthy weight loss. Cardio Boost is the result of years of research bringing the right combination of ingredients together in order to completely address the needs of the cardiovascular system. The 1998 Nobel Prize for medicine was given to Dr. Louis Ignarro and his partners for their research on the Nitric Oxide Pathway. Nitric Oxide is created natural by your body when given the amino acid L-Arginine. This research created a frenzy of interest both in the pharmaceutical and nutraceutical fields! Now, there are over 100,000 published medical studies attesting to the fact that amino acid L-Arginine will help the human body regulate every aspect of cardiovascular function. This research has led to several very effective pharmaceutical medications. The key to the formula is 5 grams of arginine. HHG’s Pure Essentials Fruits and Vegetables are grown with no pesticides or herbicides that have been put through a proprietary process based on juicing the whole food, then in the most gentle manner, drying the whole food in order to maximize the active components and provide them in their most concentrated and healthy form. 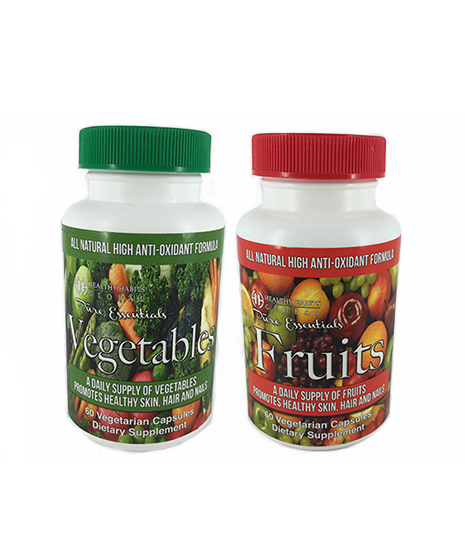 By taking 2 Fruit Caps in the morning and 2 Vegetable Caps in the evening, with HHG’s Pure Essentials Fruits and Vegetables you are consuming 15 full servings of whole fruits and vegetables each day!